How to Breathe Life into your Stories! Plus Special Summer Offer! How to breathe life into your stories! - Did you know that a story is the heart of a presentation? - Did you know that characters' dialogue is the heart of a story? - Did you know that using characters' actual words is one form of dialogue which breathes life into your stories and, in turn, enhance the success of your speeches or presentations? Super Summer Special audios + FREE e-Book copy! Story is the heart of a presentation! Dialogue is the heart of a story! FACTS only TELL, but SUPERB STORIES SELL because people buy into your message and are moved to action only when they are engaged both intellectually and emotionally! This month we'll discuss how to breathe life into your stories by using characters and their dialogue. Character to character dialogue which hypothetically brings characters in a scene and gives them voices stating their actual words. "The athletic leader trained his team by telling the guys that they needed to..."
...your speeches will become too lengthy, impersonal, sounding like an article or report and lacking life. The result: a bored, disengaged audience! "The athletic leader trained his team by saying: "Hey guys, we need to..."
This is the difference between the use of 3rd person narrative and 1st person dialogue. and the result will be an interested, connected, engaged audience! WARNING: Too much narrative is a report!!! Too much dialogue is a play!!! Finally, to make your point of the story to the audience, step out of the scene and talk directly to your audience in a slower lower voice, stating your brief message/lesson and call to action, or a question for them to ponder abdout the story's message. Using character to character dialogue is a wonderful opportunity for vocal variety and body language when demonstrating emotions with the exact words and phrases stated by characters; it's also a way to breathe life into our stories and uncover natural humour. The audience becomes mentally and emotionally involved and engaged, and buy into your message more readily! Try it, you'll like it ... AND SO WILL THEY! Until next month, when we discuss the other 2 forms of dialogue, I wish successful speaking to you! Invest in the MP3 and get the eBook FREE! 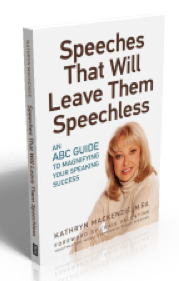 “… your book is amazing! I always base my readings on getting something to use (whether consciously or unconsciously) Your book provided that in the first few pages! I have been speaking for a few years but always trying to improve… a GREAT instructional piece as well as a great reference/reminder to keep myself centered.I will use it forever!